It’s that time of the year when we start to have people over for light spur-of-the-moment gatherings again. Here in Minnesota, we slough-off the heavy jackets, start working in our yards, and finally get an opportuntity to visit with our neighbors after the long winter. Yes, I’ve been banging the drum about how much I enjoy the colder months, but I also get excited to invite guests over to our backyard for drinks and appetizers once the weather warms. 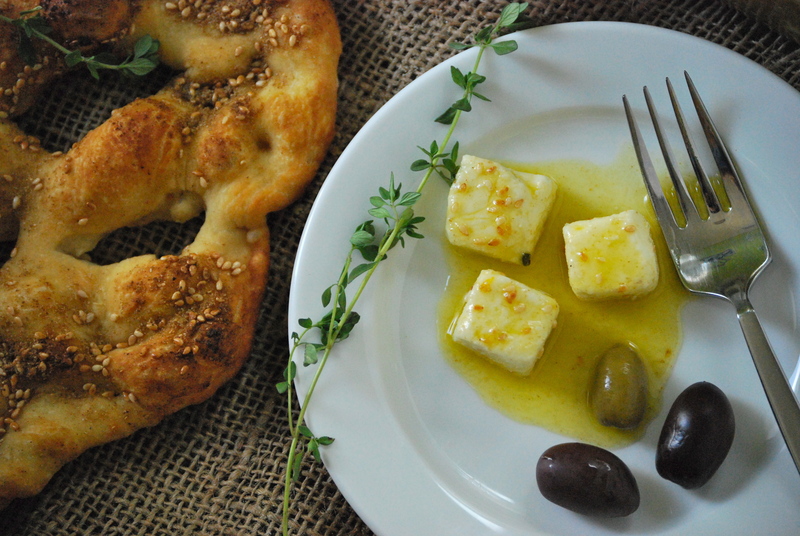 Today’s recipe is a tasty combination of marinated cheeses and fougasse. It’s perfect to serve with a cocktail or two while you’re visiting with friends. It may look a little fussy to make, but I assure you, it’s simple. 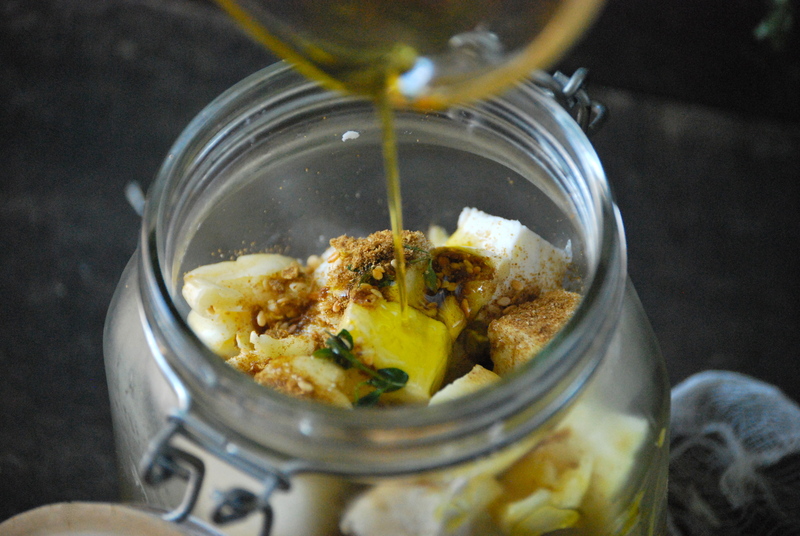 All it takes is combining cheeses and marinating them in olive oil with some spices. The result is a beautifully flavored cheese that is wonderful when paired with some bread and olives. The longer it marinates, the more flavorful it becomes. I pressed mine into a glass square food storage container, since I wanted square bites. But when chilling the cheese initially, you can also roll it into a log form and then cut it into pieces right before marinating. It can last in your refrigerator for about two weeks. I chose feta, but if feta isn’t your deal, try goat cheese, ricotta salata, or even a sharp blue cheese. If you choose to use something a bit softer, such as goat, you can omit the cream cheese and just increase the total amount to 12 ounces. You get the idea. You have a fair amount of leeway with the spices. If you prefer the flavor of other combinations, give them a try. The bread is called fougasse. 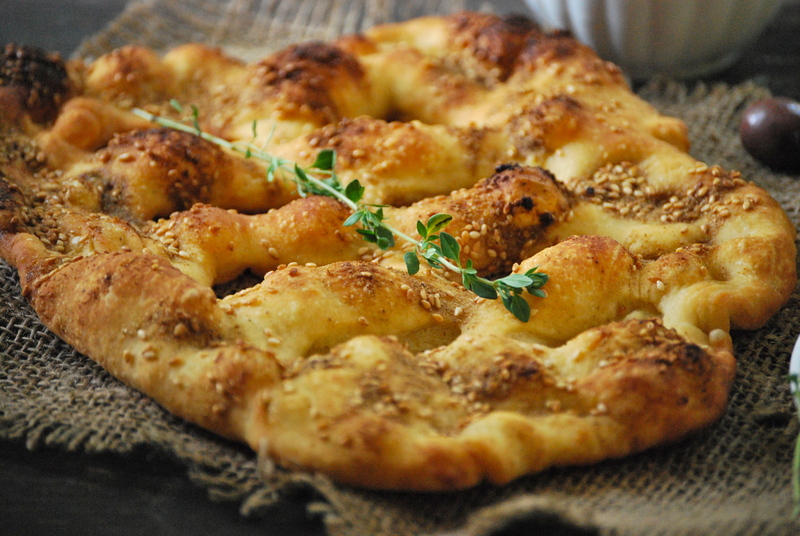 This one is simple and may be a bit more crispy than traditional fougasse– which is fine with me. I used the recipe from my favorite pizza crust (genius, right? ), because I often have a bit leftover. I’ve found that the longer the dough stays in the fridge, the more developed the flavor becomes. I usually try to use it within two weeks, which timing-wise works out perfectly with the cheese. Sit in the sunshine with your friends and neighbors and enjoy these fantastic nibbles. Cheers! 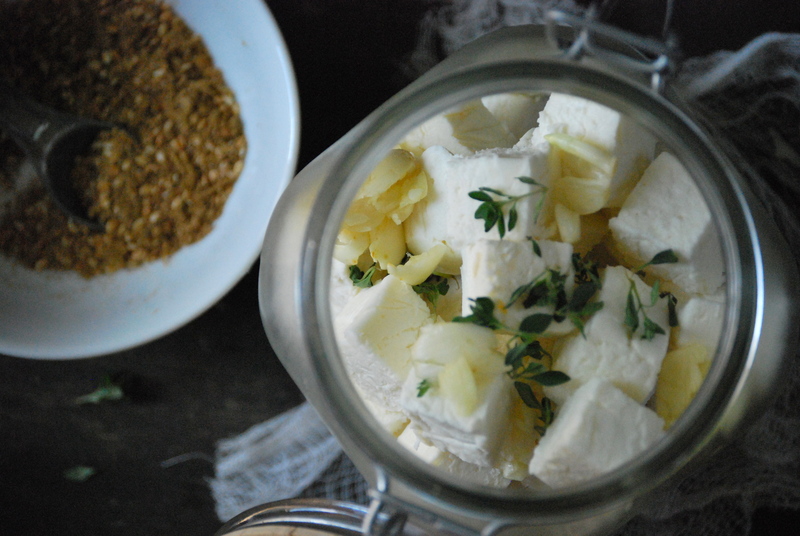 To make the cheese: Using a food processor, (or a bowl and wooden spoon) combine the feta and cream cheese until somewhat smooth. 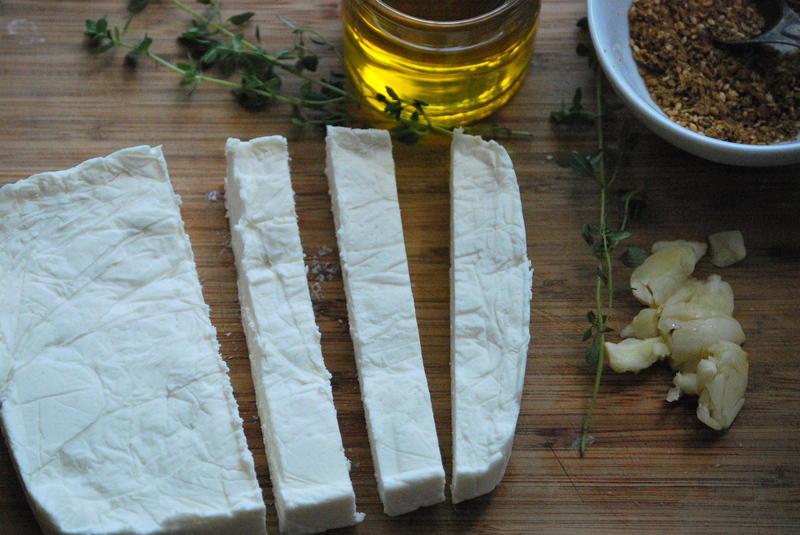 It’s ok to have some chunks of feta. Line a container that will hold the amount of cheese you have with plastic wrap. I used a square food storage container (or place it on parchment paper and roll it into a tight log). Fold the plastic wrap over the cheese so that it is entirely covered and gently push down– you want the cheese to become firm. Find something to weight it down a bit (I actually ended up using some of my kids’ building blocks– they fit perfectly). Then place a plate on top of that. The goal is to compress the cheese as much as possible. Place everything into the refrigerator for at least an hour to firm it up. Remove the cheese from the container by gently lifting out the plastic wrap. Cut it into bit-sized squares. 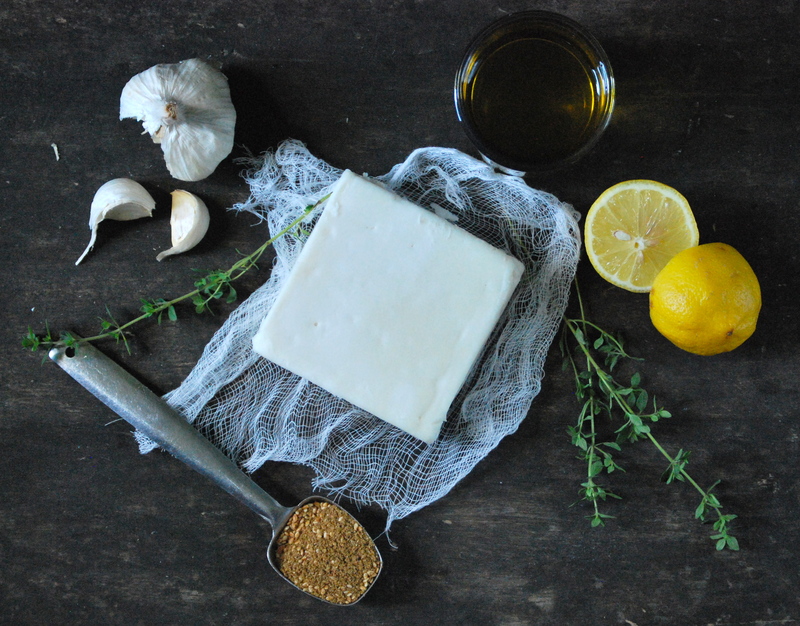 Place the cheese into a glass jar and top with the lemon zest, garlic, spices, herbs, and finally the olive oil. Gently swirl the mixture around to make sure everything get coated. If all of your cheese isn’t fully covered, add a bit more olive oil. Cover and place into the refrigerator and let marinate for about three days and up to two weeks. 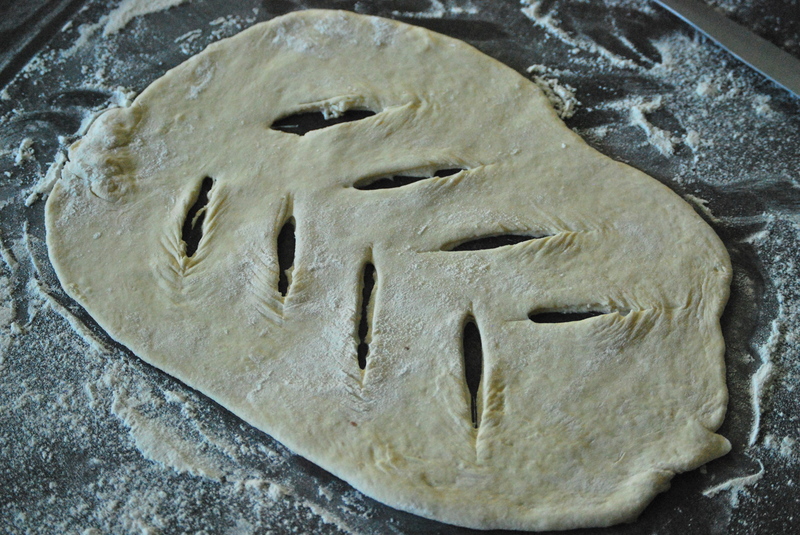 To make the Simple Fougasse: Pre-heat your oven to 500°F. Place a baking stone in it and let it heat for about 1/2 hour. Sprinkle a work surface with semolina or all-purpose flour (semolina will not stick to the bread as much when baked). Roll out a piece of the dough so that the size can fit on your stone. Cut about 4 slits on each side into it with a sharp knife (see photo). You may need to tug at the slits a bit, so they become a bit larger and more oval. Sprinkle more flour on the back of a baking sheet or a pizza wheel. Gently pick up the dough and place it on the sheet. Make sure you are able to move it around freely, if not, add more flour underneath it– you want the dough to easily glide off the pan and onto the stone. 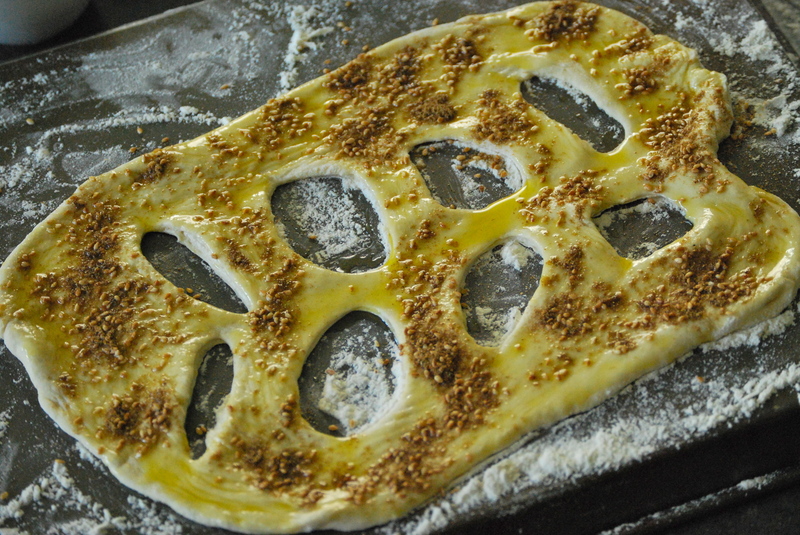 Brush olive oil onto the dough, then sprinkle with the spices. Starting in the back of the stone, quickly and confidently glide the dough onto the stone from the pan. Bake for just a few minutes (maybe 10, but it really depends on your oven– so keep a watchful eye) or until the bread looks to be a deep golden brown. Remove from oven. 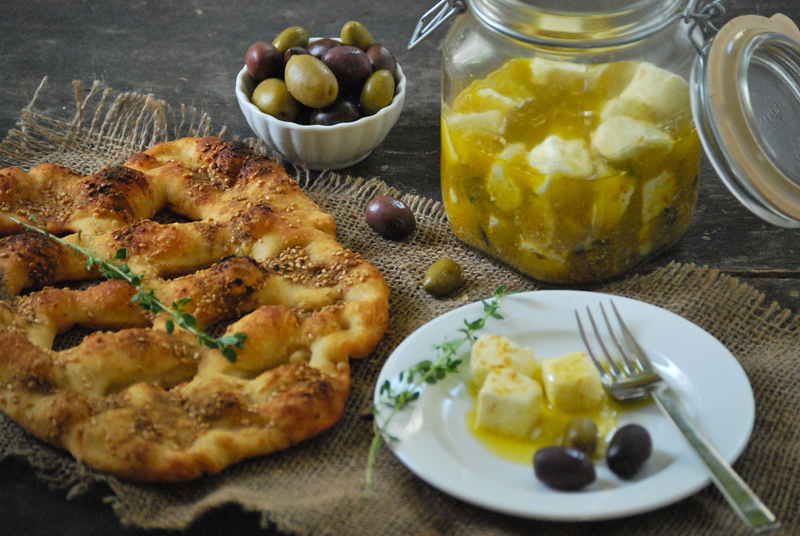 Enjoy with the spice-marinated feta cheese and some delicious olives! The title of this post might be a little misleading…mainly because it is, in fact, misleading. 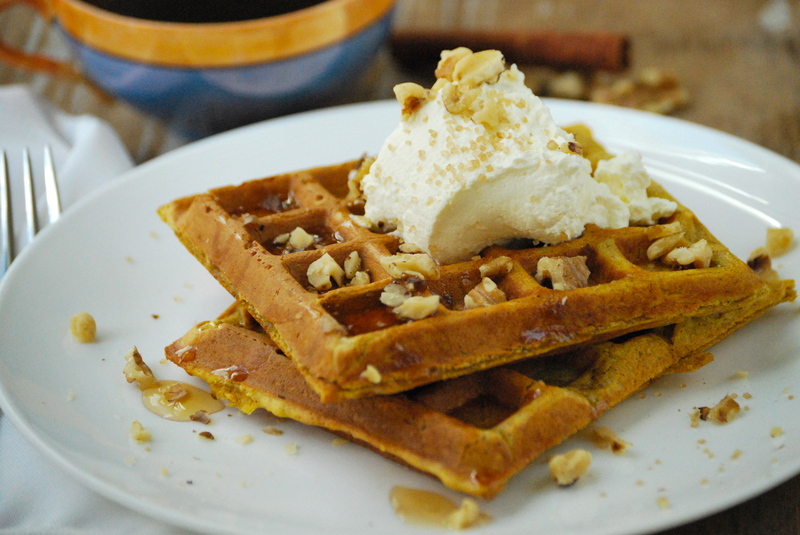 These aren’t pumpkin waffles. 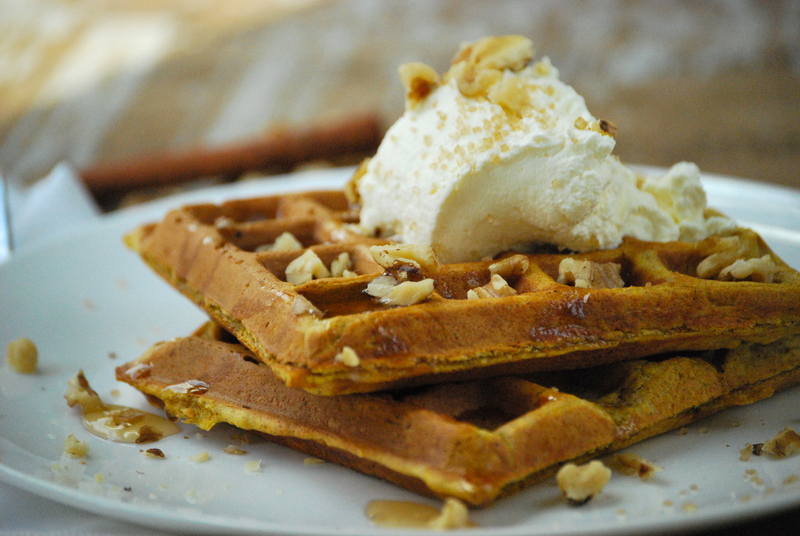 These are Sweet Mama Winter Squash Waffles. Aside from the fact that it doesn’t roll off the tongue, I figured ‘squash waffles’ might turn some of you away. Here’s the thing though, these taste a lot like fresh pumpkin. 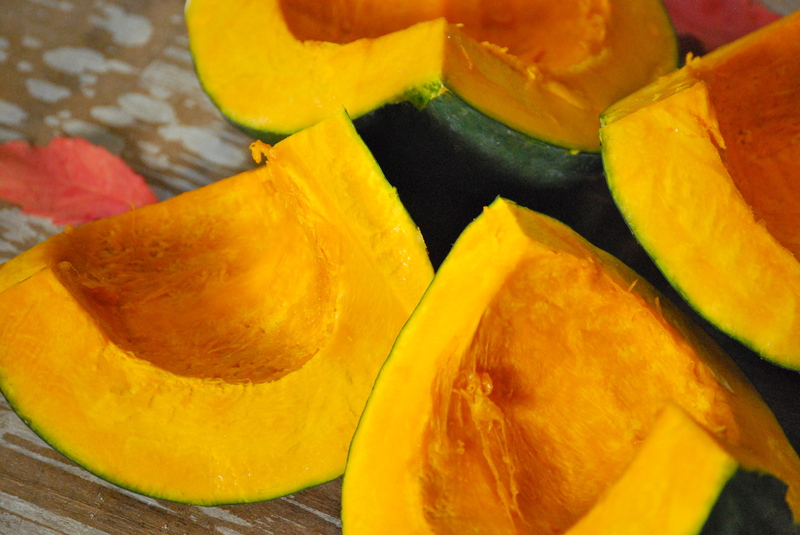 And besides, most of the canned pumpkin you find at the market contains squash. Bet you didn’t know that. I guess what I’m saying is, I’m comfortable with the deception. Weekend breakfasts are one of my favorite Fall events– and yes, I consider them an event. We aren’t in as big a rush to leave the house in the mornings as we are in the Summer. The farmers market isn’t as picked over when we don’t get there just after sunrise. Instead, we lounge around in the morning, watching Liverpool play soccer and drinking French-press coffee, while the kids play nearby. My homebody boys, Aanen and Radd, really love these lazy Fall weekend mornings. Although I was a bit deceptive at the top, I’m not when I say these waffles are near perfect. I’ve done my best to make them more healthy by adding whole grains, smaller amounts of sugar, and just a bit of butter. They are perfectly spiced– not too much, not too little. I made these particular waffles from a Sweet Mama Squash, which tastes very similar to a Butter Cup. I’ve also made them with Sugar Pie Pumpkins, as well as canned 100% organic pumpkin. They all work well, so don’t feel that you must puree your own. (But if you do, I have another fantastic recipe later this week for your left-over squash). Whatever you decide to use, I strongly urge you to top them with a dollop or more (so much for healthy) of freshly whipped cream and raw turbinado sugar. It adds such an amazing, sweet crunch. Try these this week, you’ll end up making them all the time. Do ahead: To make the puree — Preheat oven to 375°F. Quarter the squash or pumpkin if large or half it if smaller. Remove the insides. Place on a baking sheet lined with aluminum foil. Cover with aluminum foil if quartered. If only halved, place cut side down and you shouldn’t need to cover them. Bake for about 45 minutes or until the squash is fork-tender. Remove from oven and let cool a bit. Puree in a food processor until very smooth. Refrigerate until ready to use. To make the waffles: Preheat the waffles iron. Place the dry ingredients into a large mixing bowl and whisk them together. Add the eggs, squash puree, 2 tablespoons melted butter, vanilla, and milk. Whisk until just mixed. Let sit for 5 minutes. Add more milk, if too thick. Brush the waffles iron with a bit of melted butter. Ladle 1/4 cup into each section of the waffle maker. Make sure to smooth it out as much as possible. Cook until a deep, golden brown. Remove and let cool for a minute or so. 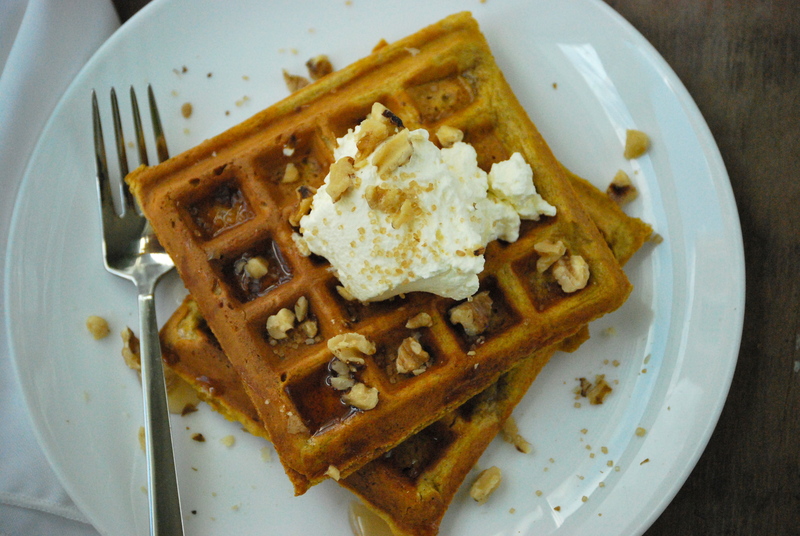 Top each waffle with real maple syrup, freshly whipped cream, toasted walnuts, and a sprinkle of raw turbinado sugar. Enjoy!